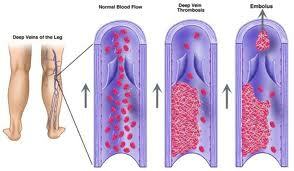 Thrombogenesis means Formation of thrombus. Endothelial injury is an obvious cause of thrombus formation. 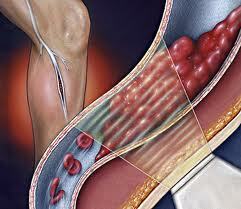 but is important to note that there is an only endothelial injury the whole wall of the vessel is not interrupted. Following events are involved. 1. Exposure of subendothelial collagen to platelets. 3. Activation of the extrinsic pathway of the coagulation system due to the release of tissue factor. 4. Local loss of Prostacyclin and plasminogen activator. Stasis and turbulence normally occur in the pockets of blood vessels that normally lies behind the cusps of vessel valves. Stasis and turbulence cause thrombosis by following effects. Prevention of dilution of activated clotting factors to subcritical concentration. Allowing build up of platelet aggregates and nascent fibrin in the sluggish stream or in pockets of stasis. In disseminated cancer, hypercoagulability is due to secretion of thrombogenic factors by tumour necrotic cells. In trauma, hypercoagulability is due to vascular injury. Interference in the generation of protein C.